Dennis Oland's retrial in the 2011 bludgeoning death of his father Richard Oland enters its second week in Saint John today. That makes Shannon’s July 7, 2011 interview of Ainsworth an important element in the case. Crown prosecutor Jill Knee not asking much about the Shannon/Ainsworth exchange. Defence lawyers waiting for their turn. Shannon also spoke to bldg. owner John Ainsworth, who approached him. Shannon left the scene around 10:18 a.m. and went back to the station, but was called back by acting Sgt. Miller at 10:46 a.m.
His task was to stay on the sidewalk in front of the bldg, stop any civilians from entering, and note officers going in and out. Const. Trinda McAlduff (then cadet Fanjoy) was with him. He was there until 2:10 p.m. when he was relieved by another officer. 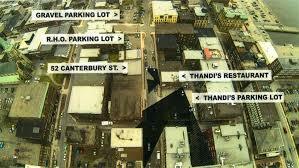 At 3:09 p.m., he was asked to go back to the scene again and assist with an article search of the surrounding area. Purpose was to look for anything that might be deemed suspicious - a weapon, clothing, something of that nature. 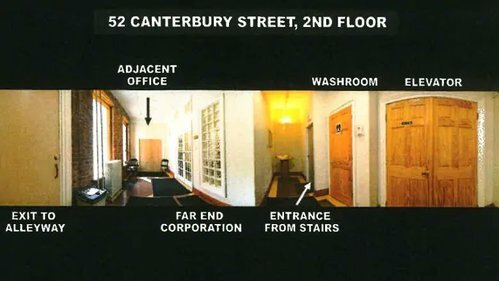 Knee asks Shannon about the back door in the second-floor foyer, which the defence contends would have been the preferred exit route of the "killer or killers" and which wasn't tested for forensic evidence. Along his route, Shannon says he was looking anywhere someone could hide something - tall grass, underneath vehicles, behind dumpsters. He remembers a pile of rubble. "I wasn’t picking things up and moving them, but poking around, looking around," he says. 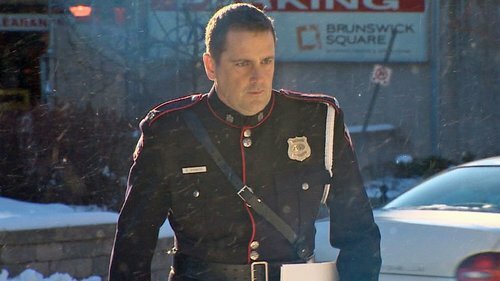 Defence lawyer Michael Lacy now questioning Cst. Shannon. Shannon recalls there appeared to be some construction on Canterbury St. He took notes about heavy equipment, piles of concrete. Knee asks what type of construction. He doesn't recall. You spoke with John Ainsworth the morning Richard Oland’s body was discovered? Yes. You got some information from Ainsworth on when he left work the previous evening? Yes. And you spoke also to someone who was with Ainsworth the previous evening - Anthony Shaw? Yes. Oland defence lawyer Michael Lacy now cross-examining Const. Shannon. 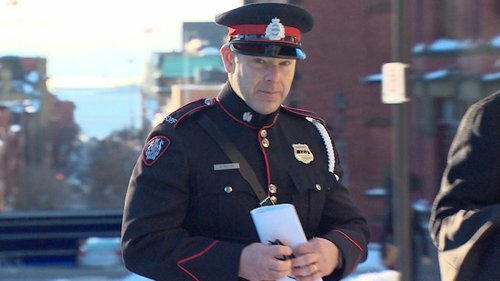 He's asking him about some of the people he spoke to at the scene, after Richard Oland's body was discovered and the notes he took about what they said. And Shaw said some things to you about what he had heard the previous evening while in the building? Yes. Shannon hestitates and Crown Prosecutor PJ Veniot rises to express concern with where questions are going. Cellphone of court spectator rings. "Whoever has that cellphone, would you please put it on silent?" asks Justice Morrison. Defence permitted to continue. Was Mr Shaw clear in what he told you? Yes. Also spoke to Anthony Shaw, who had been with Ainsworth that night. 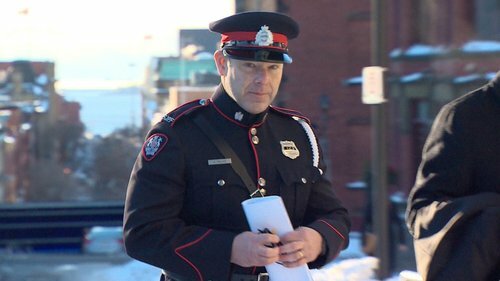 Said they had been there 6:20pm-9:20 p.m. Had not heard anything unusual until 8 p.m. when he heard 5 or 6 loud "stomps" coming from Oland's office upstairs. Did he say he was in the building between 6 and sometime after 9 and nothing unusual happened until 8:00? That’s what he told me. And at 8:00 pm he tells you he hears 5 or 6 “stomps” and then hears nothing after that? That’s right. Lacy moves on to asking about other tasks Shannon had that day - including protecting the crime scene. You were to keep the public away? Yes. Anyone tell you to restrict access to other officers? No. Did anyone ask for your shoes to check them for elimination purposes against marks at the scene? No. Court breaks for lunch. Resumes at 1:30. Timing is very important in this case. The defence has security video of Dennis Oland shopping with his wife in Rothesay around 7:40 p.m. They contend the noises were of Richard Oland being killed. What else could they have been, they argued during opening statement. Lacy asks if anyone ever asked Shannon to submit his footwear for any reason in relation to the case. No. On redirect, Knee asks what/if any observations Shannon made re. blood on his footwear. None that I recall, he says. Trial breaks for lunch. Back at 1:30 p.m.
Court resumes for afternoon sitting of Day #4 . Crown calls a fifth officer, Cst. Shanda Weir. Dennis #Oland retrial resumes. Const. Shanda (Eleuterio) Weir is on the stand. 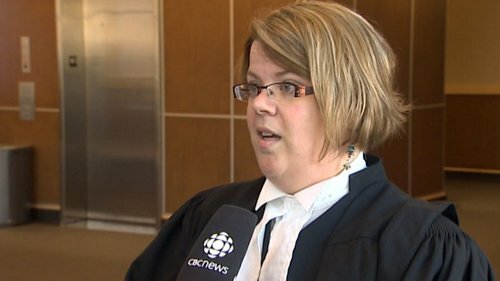 Crown prosecutor Jill Knee is questioning her. Weir said she was not summoned to the scene but was on patrol with a cadet and knew there was a major situation at the murder scene and made her way there to offer assistance. She wasn't dispatched to the scene, but attended to see if she could help. Was involved in Richard Oland's BMW being towed from the parking lot at the corner of Canterbury and Princess streets to the then-police station on Chipman Hill and secured. She is assigned to oversee the towing of Richard Oland’s BMW from its parking spot which she does. She returned to 52 Canterbury St. and relieved Const. Duane Squires, handling scene security. Weir was given other tasks - first recording those who entered and left the building and later “scene security” inside to prevent unauthorized people from coming into Oland’s office. Weir says she never entered Oland’s office herself. She does notice when doing scene security upstairs that the back door to the back alley is now open. Weir had a cadet with her, Robin Govindsamy. They remained in the foyer outside Richard Oland's office until 6:14 p.m. when they were relieved by another officer.